We love dogs, but sometimes they can get pretty gross and smelly. Washing your dog can be a difficult process, especially when you don’t know what type of shampoo they need. In this post, we’ll learn about the best methods for getting your pup clean with the right dog shampoo. If you’re a new pet owner, you may be a bit overwhelmed with the process of cleaning your dog. To help ease your anxiety, we put together a list of frequently asked questions about the best methods for bathing your dog. Why Can’t I Use My Own Shampoo? Dogs and humans are very different, so they have different needs when it comes to getting clean. Human shampoos have different PH levels than dog shampoos, and often use stronger detergents and scents. Using a shampoo formulated for human hair can dry out your dog’s skin, or even lead to an allergic reaction. This is why we recommend that you only use shampoo specifically designed for your dog’s coat. Unless your dog has sensitive skin, there is no required bathing schedule. The frequency of bathing depends on a variety of things, including their breed, length of coat, and how active they are. If you are unsure of how often you need to bathe your dog, take some time to do research on the dog’s breed. As a rule of thumb, you should try to give your dog a bath at least once a month. While humans need conditioner to keep their hair smooth, you can typically skip this step when it comes to bathing dogs. Conditioner is not necessary for a proper bath, especially if you are only washing them once a month. There are merits to applying a coat of conditioner on your dog after a bath. Dog fur conditioners help seal your pup’s coat, making it easier to brush and dry. If your dog needs frequent baths, we recommend that you apply conditioner after each wash.
Can I Use Shampoo on My Dog with Allergies? Some dogs have extremely sensitive skin, which can be irritated by harsh detergents and scents. If you notice that your dog has a reaction to shampooing, you may want to switch up your shampoo brand. There are plenty of hypo-allergenic shampoo options that will give your dog a good clean without irritating their skin. When searching for hypo-allergenic shampoos, look for brands that advertise a soap-free formula with natural ingredients. This includes ingredients such as aloe vera, oatmeal, vitamin E, and fatty acids. Bathing your dog can be a difficult process, especially if you don’t know what you’re doing. Here is a brief guide on how to successfully give your dog a scrub down. Brush Your Dog. This step is important, as it removes any shed hair or tangles. Hair that is matted can hold water, which may irritate your dog’s skin. Protect the Ears. If water gets into your dog’s ear, it can cause irritation or infection. To prevent this, gently place cotton balls in your dog’s ear to protect them from spraying water. Fill Tub with Warm Water. When bathing your dog, take care that the water is lukewarm. Water that is too hot or two cold may cause discomfort in your dog, making the bathing process more difficult. Ease Your Dog In. Not all dogs love getting in the water, so it might take a little convincing to get them to behave. Coax your dog into the tub with treats and affection to help ease them into the process. Never use excessive force or loud commands. Apply Dog Shampoo. After wetting your dog thoroughly, follow the instructions printed on your chosen dog shampoo brand. Apply the shampoo throughout the coat, working it into a gentle lather. Avoid getting shampoo in sensitive areas, such as the face or behind. Rinse Well. It’s extremely important to rinse all of the shampoo off your dog. Leaving any shampoo in their coat can lead to irritation of the skin. We recommend that you rinse multiple times to make sure you got everything off. Dry Off. Drying off your dog properly will ensure that your pup will stay clean and free of skin irritation. You can dry your dog off with towels, or use the cool setting on a hair dryer. Never use hot hair from a blow dryer, as it can cause itching or dandruff. Praise Your Pup. Even if your dog spent the whole bath wiggling, you’ll want to praise them for a job well done. This will help the build a positive association with bath time, and strengthen the bond between you and your pet. Dogs with sensitive skin need to be bathed more often than those without, and often require specially medicated shampoos. Here are three of the top anti-itch dog shampoos that we have to offer. This itch relief shampoo helps soothe skin with micronized oatmeal and vitamin E ingredients. The alpha-hydroxy element helps get deep into your pet’s coat and skin, clearing out pores and loosening dirt and allergens. This shampoo is soap free, so it will not interfere with flea or tick treatments. provides a protective antibacterial coating in the fur and skin. 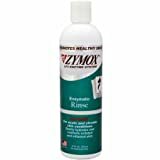 The Zymox Pet Enzymatic Shampoo is formulated to defend against microbes that can infect a dog’s skin. It uses mild plant-based ingredients that give a deep clean without irritating or drying out the skin. This shampoo uses vitamin D3 to help alleviate irritated skin while simultaneously adding more moisture. It has a mild, pleasant scent that won’t overpower. FAST RELIEF - Vet's Best Hot Spot Dog Shampoo has a natural formula that provides fast relief for itchy, dry, and irritated skin. NATURAL INGREDIENTS - Key natural ingredients include a soothing mixture of tea tree oil, aloe vera, and chamomile to relieve red, inflamed skin from itching and scratching. NO-STING FORMULA - Our alcohol-free, no-sting formula provides soothing relief for red, raw, or inflamed skin. WORKS WITH OTHER TREATMENTS - Will not affect topical flea and tick control products, and safe to use on dogs and puppies 12 weeks or older. VET'S FORMULA - Veterinarian formulated and recommended, and made in the USA. The Vet’s Best Hot Spot Shampoo for Dogs provides fast relief for dogs who suffer from itchy and dry skin. The natural formula includes soothing ingredients such as tea tree oil, aloe vera, and chamomile. This shampoo was formulated by veterinarians, and has been thoroughly tested to provide the maximum relief for red and itchy skin. When your dog has fleas, you’ll want to take care of them as soon as possible. Besides flea treatments, medicated shampoo is one of the best ways to kill those nasty pets. Here are three anti-flea shampoos that will kill fleas and keep your dog clean. Adams is a brand known for their safe and effective flea and tick control products. Their Flea & Tick Cleansing Shampoo kills fleas, ticks, and lice. It can also kill flea eggs, and helps prevent new eggs from hatching for 30 days. This shampoo can be used regularly, and helps clean and deodorize your dog while simultaneously protecting them from pesky pests. Enriches dog's skin and coat with Vitamin E & Jojoba Oil leaves a soft peach fragrance that lasts for weeks. This is an all-around flea and tick shampoo that can be used on dogs, cats, ferrets, and even horses. The No-Bite Flea and Tick Shampoo kills fleas on contact, and helps prevent flea eggs from hatching. This shampoo also cleans and conditions your dog’s fur, leaving behind no sticky or oily residue. This popular brand of medicated shampoo eliminates fleas and ticks without drying out your dog’s skin. It is formulated with natural ingredients that quickly kill pests without exposing your dog to harsh chemicals. Keep in mind that this brand of shampoo will not kill flea eggs, so it’s recommended to mix this shampoo with other flea treatments. Shedding can be a huge problem, especially if you have a dog with a thick coat of fur. Below are three shampoo options that will help you keep your dog’s shedding under control. 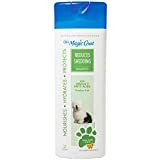 Magic Coat’s Shed-Reducing Shampoo is made with a compound of omega-3 fatty acids that aim to help reduce shedding. Its special formula is safe for all fur types, but typically best for dogs with a heavy coat. This shampoo is paraben-free and leaves behind a fresh honey vanilla scent that lasts for days. 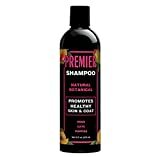 This shampoo helps to gently pull loose hair free to prevent major shedding throughout the house. The omega-3 fatty oils also help seal your dog’s hair to help keep it attached to their coat through the heavy shedding season. The Fresh ‘n Clean Deshedding Shampoo is safe for frequent use, and gentle enough to be used on elder dogs and puppies. The Foamcare Pet Shampoo High Density for Thick Coats helps promote optimal coat health with an anti-inflammatory and hypoallergenic formula. This special shampoo protects a dog’s natural oils to keep their skin healthy and their fur attached. There are other variations of this shampoo for other types of dogs, including a formula for fine or moderate coats. If your dog has a reaction to harsh detergents and scents, it’s best to go for a shampoo that only uses natural ingredients. Here are three of our top dog shampoos made from organic ingredients that are safe for your dog’s skin. This natural shampoo leaves your dog’s hair completely clean, without leaving behind any oily residue. It uses natural botanical extracts to gently lift dirt and allergens from the coat, leaving behind a brilliant shine. This shampoo is also known to brighten your dog’s coat colors, and helps keep white coats looking pure and clean. Soothes and speeds healing of dry, irritated skin and moisturizes while revitalizing dry coats. Will not wash out spot-on" flea & tick protection"
Oatmeal and chamomile are well known for their gentle and conditioning cleansing properties. The Natural Chemistry Oatmeal & Chamomile Shampoo leaves your dog’s coat feeling soft and looking extra shiny. This shampoo has 100% natural ingredients that are pH balanced, paraben free, soap free, and fragrance free. 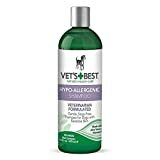 RELIEF FOR SENSITIVE SKIN - Vet's Best Hypo-Allergenic Dog Shampoo for Sensitive Skin is a gentle, soap-free shampoo for dogs that relieves itching and helps to smooth dry, brittle coats. NATURAL REMEDY - We use a veterinarian formulated blend of key natural ingredients like aloe vera and vitamin E to comfort and relieve your pet. TOTAL CARE - Vet's Best Hypo-Allergenic Dog Shampoo is part of our complete treatment system for dry and sensitive skin. 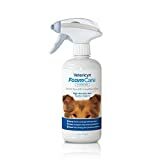 Use with Vet's Best Moisture Mist and Vet's Best Ear Relief Wash & Dry. This natural shampoo was formulated specifically for dogs with sensitive skin that is prone to allergic reactions. 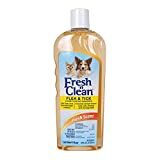 It uses a veterinarian-approved blend of natural ingredients, such as aloe vera and vitamin E.
The soap-free shampoo is gentle enough for frequent use, making it a great option for pets with serious skin and coat issues. Conditioners help seal a dog’s coat and keep their fur looking and feeling smooth. At Pro Pet Supplies, we know it can be difficult to keep your dog settled during bath time. These combination shampoo and conditioners are just what the doctor ordered for a finicky pup with a thick coat. This creamy combination formula works deep into the fur to cleanse and condition all at once. It has natural ingredients such as coconut, lanol extract, and shea butter for a deep, soothing cleanse. The Durvet Naturals 2-in-1 Conditioning Shampoo lacks any products with soap or alcohol, making it gentle enough for frequent use. Fresh ‘n Clean’s 2-in-1 Shampoo/Conditioner allows dog owners to clean and condition their pet in one simple step. It uses soothing ingredients such as vitamin E & aloe to clean, strengthen and repair your dog’s coat. The gentle baby powder scent is not overpowering, and will leave your dog smelling clean for up to two weeks. Cleanses. Blend of papaya, coconut, and other tropical ingredients pampers your pet in a rich, luxurious lather. Conditions. Unique blend of papaya and kiwi helps replenish the natural moisture balance of their skin and coat. Detangles. 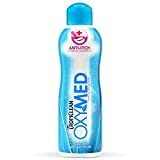 Unique blend helps relax tangled hair for easy brushing. This luxury 2-in-1 shampoo and conditioner will help keep your pet's skin and coat soft, shiny, and smelling fresh. Formulated for dogs and cats of all ages. The tropical scent of papaya and coconut make this one of the best smelling shampoos on our list. It cleans and conditions your dog’s coat, all without the use of harsh soaps and detergents. 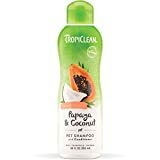 The Tropiclean Papaya and Coconut Shampoo/Conditioner is made from all-natural ingredients that are 70% organic. Washing your dog helps keeps their coat clean and their skin free of irritation. There’s no general standard for bathing a dog, as each coat is completely unique. If you’re unsure of the best shampoo for your dog, we recommend talking to your vet or personal groomer. They will give you the insight you need on the best type of shampoo for your dog. Next articleTop 12 Best Pro Pet Supplies Dog Carrier Options!